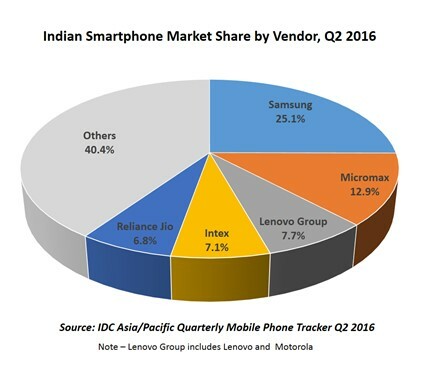 Market research firm IDC has released its latest report for the Indian smartphone market, revealing that Samsung was the top vendor in second quarter of this year. The South Korean company’s share of the market stood at 25.1%. “With updated versions of J2, J5 and J7 released in Q2 2016, J-series devices continue to drive Samsung’s shipments,” the report said. Overall, the Indian smartphone market recovered with 17% growth in the quarter. “China based vendors’ shipments grew 28 percent over previous quarter of which Lenovo group, Vivo, Xiaomi, OPPO and Gionee were key contributors driving the growth,” the report said.